Dimensions 3 by 10 by 12 in. 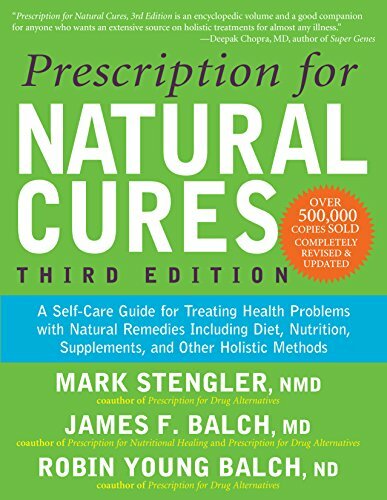 Hundreds of thousands of readers have relied on Prescription for Natural Cures as the source for accurate, easy-to-understand information on natural treatments and remedies for a host of common ailments. The new edition of this invaluable guide has been thoroughly updated to reflect the very latest research and recommendations. This revised edition prescribes remedies for almost 200 conditions, including new entries such gluten sensitivity and MRSA. You'll find easy-to-understand discussions of the symptoms and root causes of each health problem along with a proven, natural, customized prescription that may include supplements, herbal medicine, homeopathy, aromatherapy, Chinese medicine, hydrotherapy, bodywork, natural hormones, and other natural cures in addition to nutritional advice. If you and your family want to get better naturally, Prescription for Natural Cures is an essential health resource you can't afford to be without. About: Hundreds of thousands of readers have relied on Prescription for Natural Cures as the source for accurate, easy-to-understand information on natural treatments and remedies for a host of common ailments. About: The revised and updated edition of the bestselling natural health bible-more than 500,000 copies sold to date!